‘Jürgen Habermas’, wrote the American philosopher Ronald Dworkin on the occasion of the great European thinker’s eightieth birthday, ‘is not only the world’s most famous living philosopher. Even his fame is famous.’ Now, after many years of intensive research and in-depth conversations with contemporaries, colleagues and Habermas himself, Stefan Müller-Doohm presents the first comprehensive biography of one of the most important public intellectuals of our time. 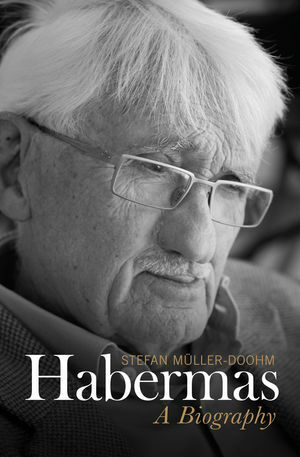 From his political and philosophical awakening in West Germany to the formative relationships with Adorno and Horkheimer, Müller-Doohm masterfully traces the major forces that shaped Habermas’s intellectual development. He shows how Habermas’s life and work were conditioned by the possibilities offered to his generation in the unique circumstances of regained freedom that characterized postwar Germany. And yet Habermas’s career is fascinating precisely because it amounts to more than a corpus of scholarly work, however original and influential that may be. For here is someone who continually left the protective space of the university in order to assume the role of a participant in controversial public debates Ð from the significance of the Holocaust to the future of Europe Ð and in this way sought to influence the development of social and political life in an arena much broader than the academy. The significance and virtuosity of Habermas’s many writings over the years are also fully and expertly documented, ranging from his early work on the public sphere to his more recent writings on communicative action, cosmopolitanism and the postnational condition. What emerges from this biography is a vivid portrait of one of the great public intellectuals of our time Ð a unique thinker who has made an immense and lasting philosophical contribution but who, when he perceives that society is not living up to its potential for creating free and just conditions for all, becomes one of its most rigorous and persistent critics. Stefan Müller-Doohm, born in 1942, studied in Frankfurt under Theodor W. Adorno and Max Horkheimer and is now Professor Emeritus of Sociology and Director of the Research Centre for the Sociology of Intellectuals at the University of Oldenburg. His other works include Adorno: A Biography. Opinion leader of the new left? Democratic politics Ð a counterbalance to capitalism? "This [book] makes for fascinating reading"
"Habermas is a biography of an accomplished living intellectual whose audience is extended much beyond the academic world. Stefan Müller-Doohm is a perfect storyteller and he tells the story of Habermas in such a way that you will not be able to put it down before you finish it. Nobody knows the art of biography better than Müller-Doohm." "Few would contest the verdict that Habermas has achieved—in both his philosophical work and in his role as a public intellectual—a place of enduring significance that surpasses that of any other thinker in our time. The definitive new biography by Stefan Müller-Doohm… lays out the evidence for this conclusion with great care and enormous sympathy for its protagonist." "Heidegger’s lapidary biographical summation, “The man was born, he worked, and then died,” may have been appropriate for Aristotle, but is woefully inadequate for the philosopher who is arguably our era’s version of the great Greek polymath, Jürgen Habermas. For not only is he still very much alive and producing new work at a vigorous pace, but it is also the case that his voluminous contributions to philosophy, sociology, political theory, and cultural criticism demand to be read in the context of his remarkable career as a committed public intellectual. As his masterful biography of Adorno already demonstrated, Stefan Müller-Doohm shows himself to be fully up to the task of discerning figures in the intricately woven carpet of a major thinker’s life and work." "Habermas was and is an exemplary intellectual… he was a Berliner, soberly mindful of the weight of the old world, hopeful for the prospects of the new. This book is a monument to this challenge, and to his commitment."